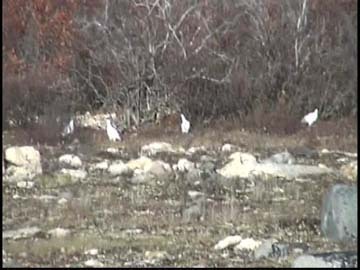 OK, OK.....I know you're just waiting to see some POLAR BEARS!!! 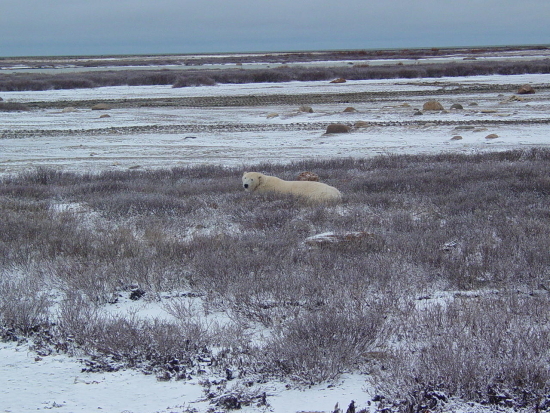 Here's the first Polar Bear we ran across about an hour into our Tundra Buggy ride. 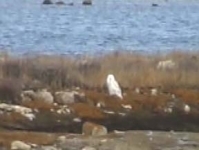 We also saw lots of other native wildlife -- several Artic Hares, Caribou (off in the distance), a Snowy Owl, some ptarmagins and an Artic Fox (who ran too fast to catch on camera). Click on the smaller photos for a larger image. 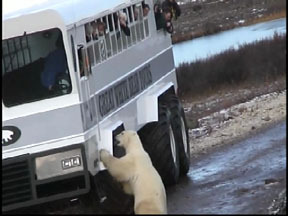 The Polar Bears show absolutely no fear of the massive Tundra Buggies. In fact, they are fascinated by them. 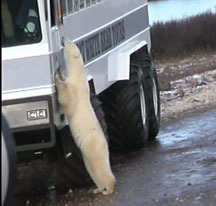 This bear spent quite a bit of time investigating the smells coming from the bus and even stopped to lick the wheel well. 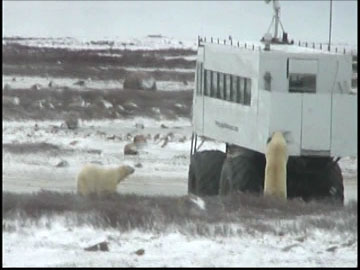 Note the size of the bears -- the wheel well is about 6' tall. 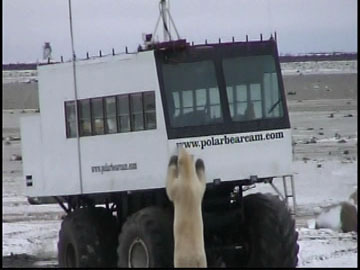 They were all particularly interested in the smaller Tundra Buggy that was home to the PolarBearCam. At one point, this small Buggy backed right into the one I was in. Car accidents in the middle of the Artic Tundra!!! Anyway, it had a hole in the back of the observation platform (more bad driving?) and one bear found it and tried to crawl up through it. The guy inside finally had to take a broom to the bear. I caught some shots as yet another bear tried the same approach. Life is very difficult in this Artic region. 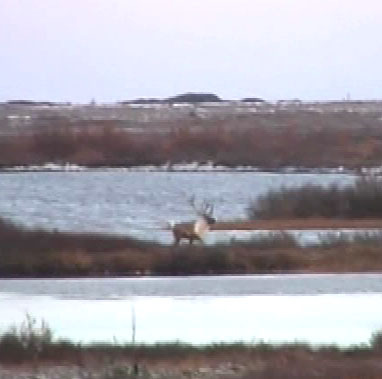 On our last day, we came across the carcass of a dead Caribou. Glenn (our guide) told us that the polar bears would eventually catch the scent and consume it. Then, they'd probably play with the antlers for days. Sorry I missed the opportunity to see that!